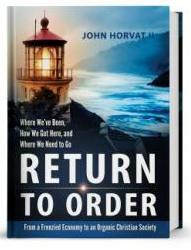 The American Society for the Defense of Tradition, Family and Property (TFP) will be publishing a new book in February titled: Return to Order — From a Frenzied Economy to an Organic Christian Society — Where We’ve Been, How We Got Here, and Where We Need To Go by John Horvat II. Based on twenty years of exhaustive research, John Horvat II traces the source of our economic problems to a restless spirit of intemperance that throws our economy out of balance. He identifies a frenetic drive found in certain economic sectors that seek to rid themselves of restraint.The result: “frenetic intemperance,” which is pushing the nation towards economic collapse. By applying the timeless principles of an organic socio-economic Christian order, we can produce an economy that is wonderfully adapted to our human nature and full of exuberant vitality, but also tempered by the calming influence of those natural regulating institutions such as custom, family, community, the Christian State and the Church.Horvat’s original insights into both the present crisis and remedies for the future thrust Return to Order into the center of the debate over how to restore America to prominence. "The central theme of frenetic intemperance is original, interesting, and compelling. The diagnosis of contemporary social maladies must focus on moral failings, and Return to Order rightly does so. Its insightful thesis deserves wide circulation and consideration." -- Kevin E. Schmiesing, PhD, Research Fellow at Acton Institute for the Study of Religion and Liberty; Book Review Editor for the Journal of Markets & Morality. "Like the true cultural conservative he is, John Horvat takes on the idols of technological, economic, and political power. These powers exacerbate the human tendency toward frenetic intemperance. Return to Order demonstrates that we must be ever vigilant about the institutions we create lest they lose their moral compass." -- Richard Stivers, Emeritus Professor of Sociology, Illinois State University. "An ambitious book that calls for a major shift in the attitudes of those of us who live in a fast-paced world. Horvat calls for an order that combines the virtues of tested traditions with the creative potential of the free economy: a combination of a structured order based on traditional values and the spontaneous order of economic systems based on private property. He uses the term 'frenetic intemperance' to describe the type of life which does not leave room for family, creative leisure, and prayer. A call for more balance in our economies and our lives." -- Dr. Alejandro Chafuen, President of the Atlas Economic Research Foundation. "Poetically written, John Horvat II’s Return to Order elevates the argument about what is truly important. It’s rare that a book of this depth is also such a pleasure to read. Mr. Horvat’s critique of contemporary America’s “frenetic intemperance” rings true, laying bare modern man’s confusion and anomie amid plenty. An erudite cultural sculptor, Mr. Horvat chisels away materialism’s false promises and points toward God as the source of the higher revelation that makes beauty, heroism, nobility, sacrifice and true vocation discoverable and meaningful." -- Robert Knight, Columnist and author.